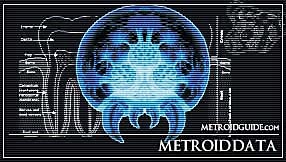 Note:Federation scientists are speculating that the Hopper Metroid might be a phase of a Metroid life cycle that leads to the development of a Metroid Prime. Since the capture of the original Metroid specimens collected by the Galactic Federation expedition to SR388 the Space Pirates have attempted to breed Metroids for the bio warfare program; on the planet Zebes, planet Tallon IV, and planet Aether. All these attempts have failed because of the intervention of the Space Hunters Samus Aran who exterminated most specimens; still the Space Pirates retained enough Metroids to start once more again.This time the Space Pirates attempted to breed Metroids on their own homeworld. While the Space Pirates’ homeworld already caused interesting mutations to take place in the Metroid genetic strain, at some point the Space Pirate scientists decided to expose Metroid eggs to large quantities of Phazon material. 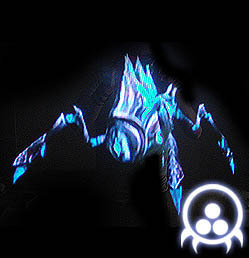 The result is a complete new and unique strain of Metroid that has Phazon in its genetic makeup and feeds on both life energy and Phazon material; Phazon Metroids. It is specifically unknown what genetic variable causes the Phazon Metroid to mutate once more, but also futher curious as to what causes the genetic offshoot of become a Hopper or Hatcher variant as well. Hopping Metroids are a terrestrial offshoot of it's airborne counterparts. The mutation is very similar to those witnessed on the Metroid's homeworld of SR388 in the basis of it gaining leg like appendages for ground locamotive purposes. The Hopping Metroid has lost its ability to float through the air through the use of kinetic energy, instead it moves around on its four legs that replace the mandibles that it used to capture prey with when it was still a Phazon Metroid. The creature can also no longer directly feed upon prey as it lacks the specialized mandibles to hold down a prey; instead it needs to incapacitate the prey creature before it can feed on it. Physically the Hopping Metroid somewhat resembles a Phazon Hopper and there is some speculation that both creatures might be somewhat related though this would require further research. Hopping Metroids and Phazon Hoppers are quite often found in each other’s company and behave the same. 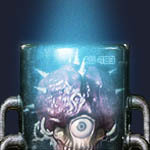 Unlike the Metroid Hatcher the Hopping Metroid is a lot more vulnerable to weapon fire.